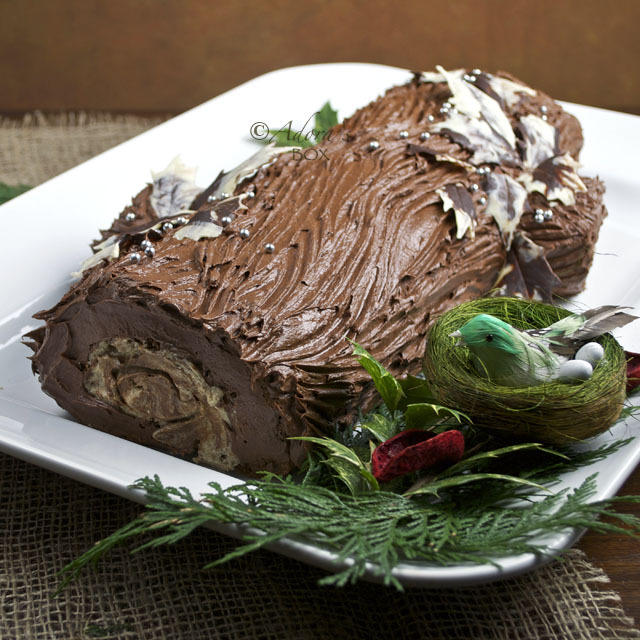 Bûche de noël is a traditional Christmas French dessert which originated from the Celtic tradition of celebrating the winter solstice. On this shortest day of the year, they would search for a large trunk of oak, beech, elm or cherry and burn it as a symbol of the rebirth of the sun. In the middle ages the youngest and oldest member of the family would carry a decorated log to the hearth and set it alight. This was believed to protect the family from illnesses and evil spirits. 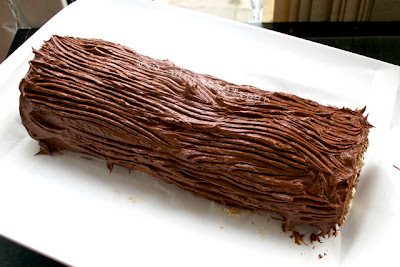 Through time the tradition evolved to serving a log shaped dessert made of sponge and buttercream. 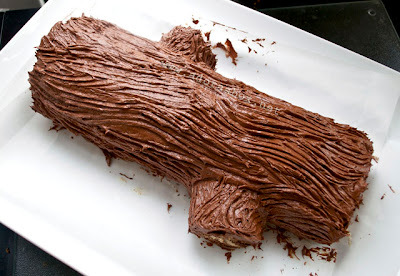 Any type of sponge or frosting and filling can be used but it usually is chocolate to make the log more realistic in colour. 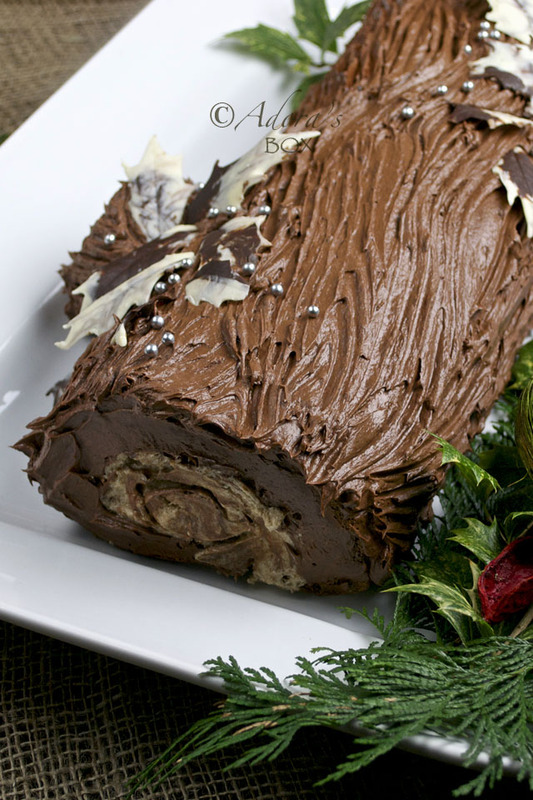 I chose a simple sponge roll adapted from Jamie Oliver's recipe of bûche de noël, but omitted the walnuts. 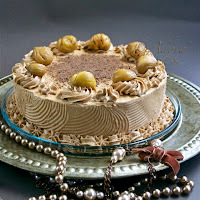 I chose to fill mine with chestnut buttercream because chestnuts is just one of those ingredients that spells Christmas. A rich chocolate truffle icing enrobes the log. This is actually an easy recipe that can be made ahead and would serve at least 12. Pre-heat the oven to 350° F/180° C. Line a 10 1/2" x 14 1/2" Swiss roll tin with baking paper, making sure that the paper is higher than the sides. Sift the flour, corn flour, cocoa, and baking powder in a mixing bowl. Whisk the egg whites until stiff peaks form, then add half the amount of sugar and whisk again until glossy. In a separate bowl, whisk the egg yolks with the remaining sugar until light and fluffy. Sift the flour mixture over the egg yolks, then fold in. Add the egg whites and fold in gently. 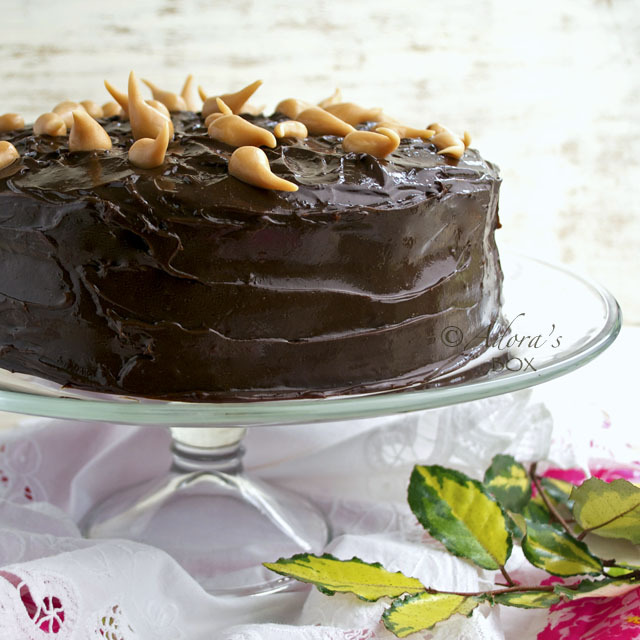 Spread the mixture evenly in the prepared tin and bake for 25 minutes or until the top is springy. While still warm invert into a sheet of baking paper. Brush with the marsala. Cut a 2" wide strip from one narrow end and divide this strip in half. This will form the stumps on the log. 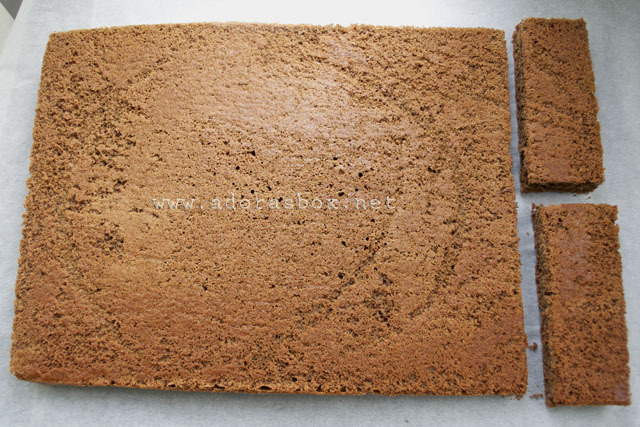 Roll the large piece of sponge along the long side, with the baking paper inside it. Secure with rubber bands. 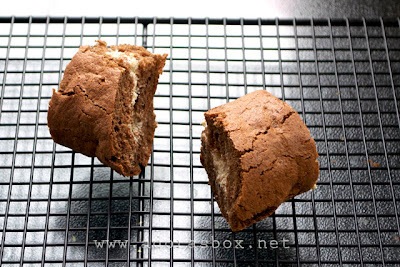 Do the same with the 2 pieces of sponge but rolling from the narrow side. Cover with a damp cloth to prevent them from drying. 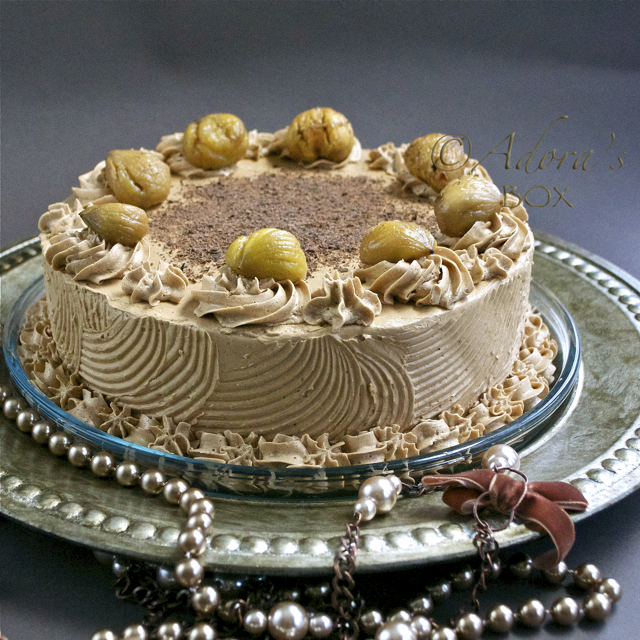 Set aside while you prepare the chestnut filling and chocolate icing. Whisk the butter until pale and fluffy. Add the sugar and the chestnut puree while whisking until well combined. Put the chopped chocolate in a mixing bowl. Put the cream and sugar in a saucepan and bring to a boil. Take off the heat, then add to the chopped chocolate. Stir until melted and leave to cool. When cooled, whisk until light and fluffy. Melt the chocolate separately in a microwave on low heat. Take out every few minutes to stir. When there's only a few solids left, just stir and there would be enough heat in the bowl to completely melt it. With a teaspoon, dab a little bit of dark and white chocolate on the underside of a holly leaf. Use a cocktail stick to spread while gently swirling to make a marbled effect. Clean the excess chocolate from the other side of the leaf so that it is easier to peel off when the chocolate sets. 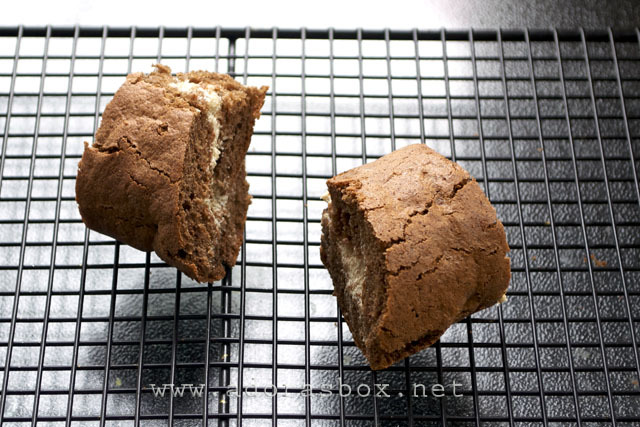 Arrange on a baking tray and freeze until ready to use. Gently peel off the leaves before using. 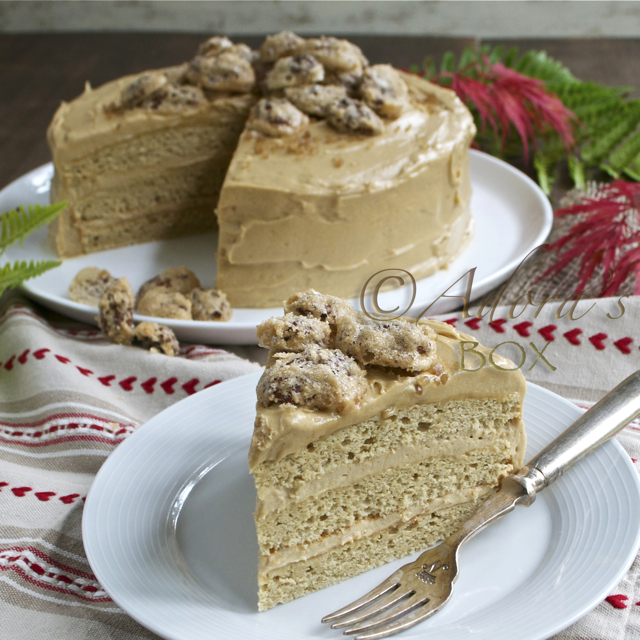 Unroll the sponge and spread the chestnut buttercream on it. Re-roll tightly. Do the same with the 2 small pieces of sponge. Cut off a diagonal piece from each small piece of roll to make slanted ends. Line your serving dish or tray with strips of baking paper along the edges to keep the dish clean while you frost the cake. 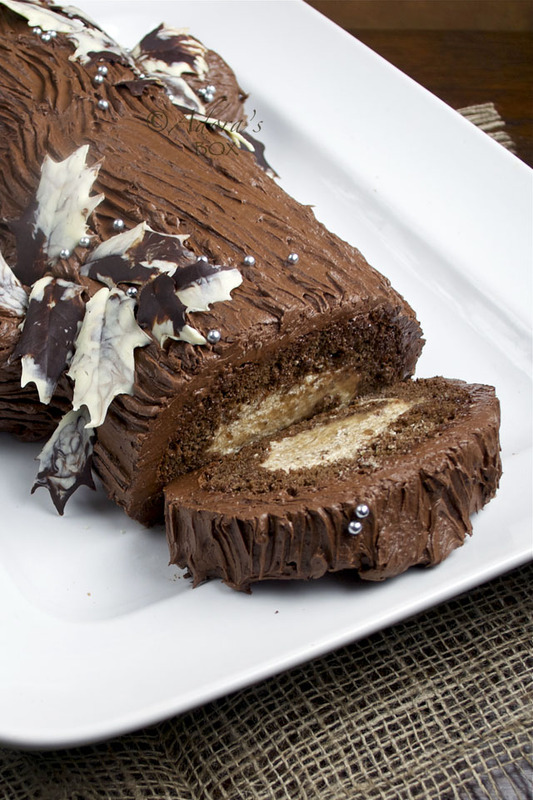 Lay the long piece of sponge in the middle and cover with chocolate icing. Drag a fork lengthwise to make patterns to resemble the grains of wood. 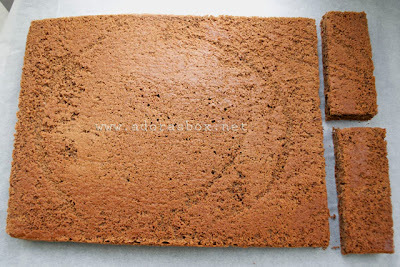 Stick the two small pieces with the slanted end on the cake and cover with icing. Do the woodgrain pattern again. 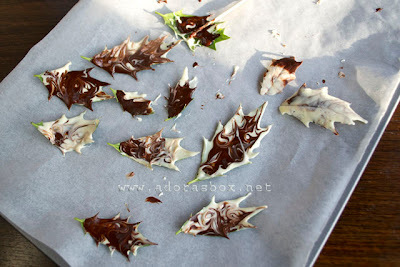 Decorate with the chocolate holly leaves or with whatever decoration you want. 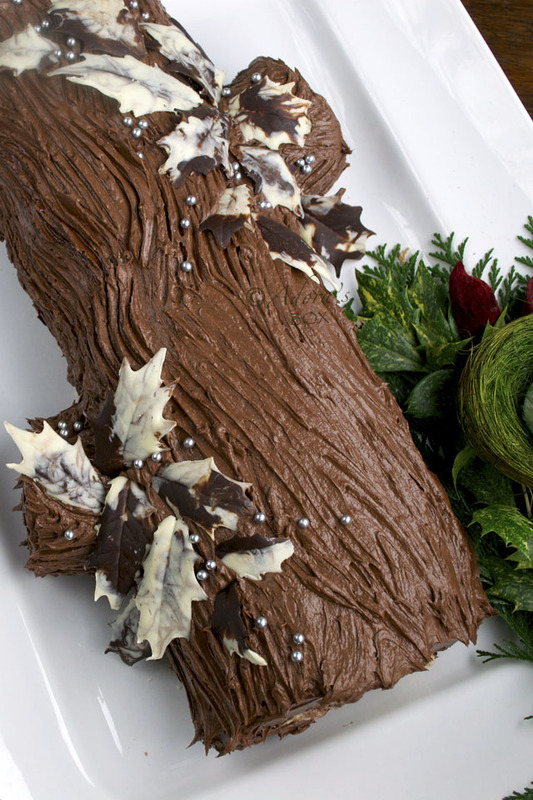 I have always wanted to make Buche de Noel and have just been too scared to do it. Your's looks so beautiful! Happy Holidays! It is beautiful!! I am so impressed! Happy Holidays! I know Christmas has passed already, but I want this cake everyday!